My husband took it upon himself to buy me a mood ring. He figured that my mood swings were a little unpredictable and he'd be able to monitor my moods. Well, so far we've discovered that when the mood ring turns green, I'm in a good mood. When I'm in a bad mood, it leaves a big red mark on his freakin' forehead. Maybe next time he'll by me a diamond. Lol. Mood rings were cool when I was a kid. 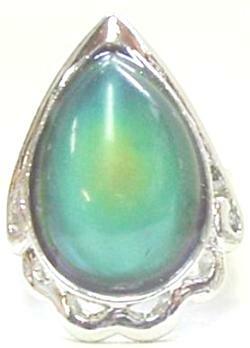 I wouldn't mind an opal ring, which kinda looks like a mood ring.